The year is 2038. Earth’s biosphere is on on the brink of destruction from the effects of global warming and pollution. The World Energy Council has awarded a lucrative contract to a major US corporation to mine a precious ore discovered by the first manned mission to land on Mars. One kilo of Micromium can power a large city for a year without environmental side effects. 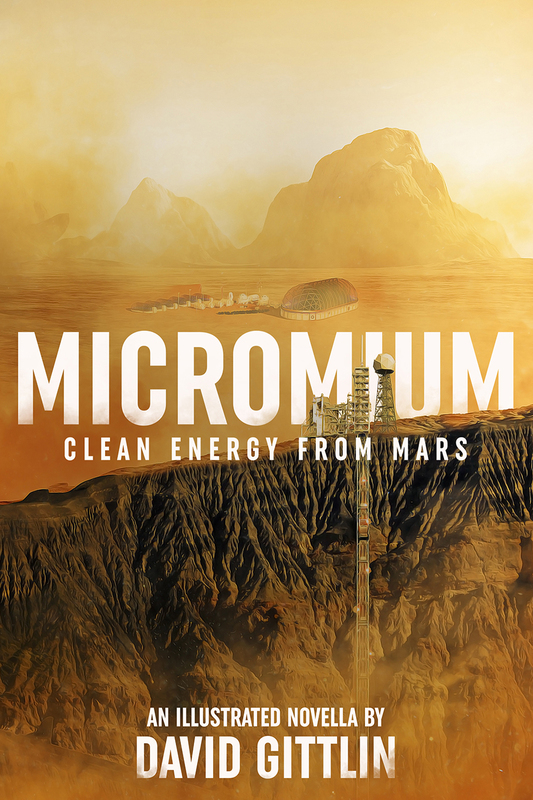 Micromium, and the development of the technology to harness its awesome power, promise to provide clean energy to a thirsty planet, far into the future. The stakes are high. World governments are counting on the success of the Micromium project. Government leaders are not in the mood for bad news. When two people die in a mining accident on Mars, the World Energy Council sends Commander Logan Marchant and a crack team of astronaut specialists to investigate. Already confronted with a lack of cooperation from the mining colonists, the investigation is further complicated by Logan’s growing attraction to the team’s beautiful and brainy geologist. While tensions and tempers rise, Logan and the audit team make one shocking discovery after another, until the investigation leads them into mortal danger, and ultimately, to a surprising conclusion. “This is trial eighteen,” Kate Blackstone announced. “Testing five one hundredths kilogram of enriched X435. In a forgotten corner of the Mojave Desert, twelve hundred miles away from the control facility where Kate sat, a robotic arm lowered a titanium cylinder into the core of a miniaturized reactor. No humans manned the fully automated testing facility—for good reason. Six scientists, including Jeremy Kornbluth, observed the test on a seventy- two-inch plasma screen. Kate sat in the middle of them with Vice President and CEO Kornbluth to her left. He had flown in with the WEC science team to monitor and report on the progress of the testing. She recalled one of their conversations from earlier in the day. “I’m really feeling like today is the day,” the WEC Vice President had confided. She was beginning to feel like Mel Fisher, the legendary treasure hunter, who used to say the same thing for years until he finally found the wreckage of Our Lady of the Atocha; a Spanish Galleon that sank in a hurricane somewhere off the Florida Keys bearing treasure worth hundreds of millions of dollars. Finding the Atocha was only the beginning of Fisher’s struggle to capitalize on the sunken treasure. He had to excavate the valuable artifacts and then fight the State of Florida for ownership rights. The discovery of an unusual ore sample by NASA astronauts during the first manned mission to Mars had been only the beginning of Kate’s struggle. She had been selected and tasked by the World Energy Council to harness the power of a substance whose composition did not match any element in the Periodic Table. To say that the task was hard was an understatement. Failure had become the norm. The only progress had been in the degree of failure. The first trial had blown up the testing facility. Her mother’s words echoed in hear head. Girls don’t become scientists, Katie. Why don’t you choose a nice profession like nursing? At times like this, she wondered why she hadn’t taken her mother’s advice. Thirty minutes passed with very little conversation in the room. Kate took shallow breaths, as if breathing too hard might upset the delicate miracle occurring in the heart of the reactor. This was the first trial that had lasted more than eight minutes. A minute later an alarm sounded. Lights inside the test chamber flashed red. Kate concealed her doubts from Kornbluth and the WEC science team. She wondered if her team would ever find the elusive mix of materials and process to safely burn X435. Would they ever find the treasure? Was the mysterious ore one of the most important discoveries in human history—or was it fool’s gold? “You want to unlock the energy potential of X435 and solve the mystery of the Martian crater’s origin. You are ambitious, aren’t you?